Obviously, switching to hand dryers to reduce towel waste is one option, but relying on hand dryers alone doesn’t seem the optimal solution, says Fabio Vitali, vice president AFH sales & marketing for the Sofidel Group, Fort Washington, Pennsylvania. A sizeable majority of Sofidel’s U.S. customers prefer using paper towels because they dry faster and better. Corcos as well cites a “strong preference” for paper towels over jet dryers. “This is most evident at an airport or other large facility that has both paper towel dispensers and jet air dryers,” he says. In response, many manufacturers have developed “zero-waste” paper towel dispensers, designed to address the concerns associated with conventional delivery systems. Depending on the system, zero-waste dispensers offer a variety of smarter options. Some hold two rolls at once and ensure the first roll is consumed before switching to the second roll. Many are designed with monitoring systems that alert to conditions like low-batteries, paper jams, and when the dispenser is full. Others have expanded capacities, holding significantly more towels allowing them to serve a greater number of guests before requiring refilling. 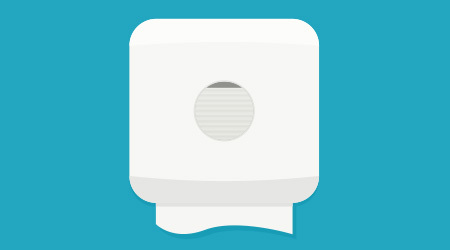 Some dispensers use roll towels, others folded, but all focus on controlled consumption, limiting the amount of paper deployed at any given time and on fully using all the towels in the dispenser. Dispensing can happen with a wave of the hand, or by pulling on the towel or pressing a lever. Additionally, these dispensers are designed for easy and quick loading by custodial staff, making servicing them much faster. Dispensers also can integrate into smart-sensing or IoT (Internet of Things) technology already present in a facility, sending customizable alerts to phones or web-enabled devices notifying custodians as to the dispenser’s condition. Such dispensers are also equipped with software allowing for the capture and translation of traffic, user and refill data, resulting in a better understanding of that specific restroom’s requirements. The real-time data generated not only leads to improved inventory management, it also results in more efficient allocation of labor and the development of proactive cleaning schedules. According to the white paper “The Value of Data-Driven Cleaning for the Facility Services Industry” released by Essity, data-driven cleaning results in dispensers that are fully stocked 99 percent of the time. By refilling dispensers only when needed rather than a set schedule reduces cleaning hours by 20 percent.